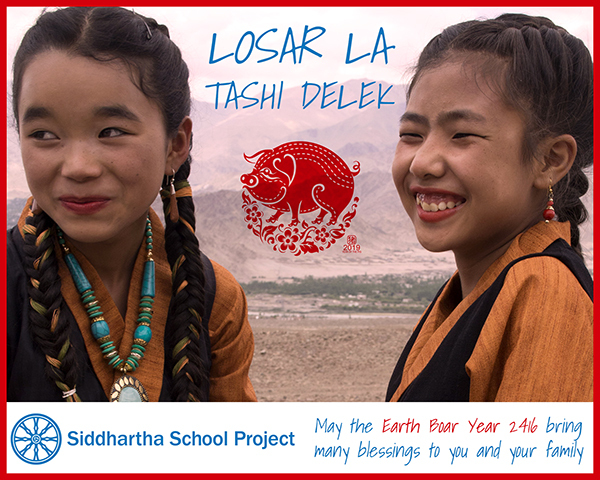 Happy Losar from the Entire Siddhartha School Family! A Little-Known Fact: Did you know that most Tibetan educators who come to India as refugees struggle to find teaching work? The Indian government requires official citizenship to teach at Indian public schools. Sadly, many displaced Tibetans are often forced to abandon their lifelong careers for lack of available teaching opportunities. At Siddhartha School, we are able to employ many Tibetan refugee teachers because of our private organization status. Their presence supports our mission to preserve the local cultural heritage, giving students a firsthand opportunity to acknowledge the significant role Tibetan Buddhism still plays in the rich tapestry of Ladakh and it’s remarkable place in the historical Himalayan kingdom. Did You Know Ladakhis and Tibetans Celebrate Losar on Different Dates? 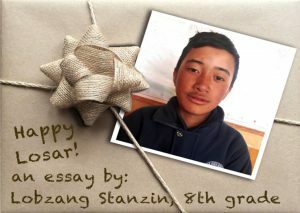 8th Grader Lobzang Stanzin Spells Out Why. The word “Losar” derives from two Tibetan words, “lo” and “sar.” Lo means “year” and sar means “new,” meaning “new year.” It falls on the first day of the first month of the Tibetan lunisolar calendar and is usually celebrated in the month of February, but for the people of Ladakh, we celebrate Losar a couple of months before the actual date in the Tibetan calendar, that is, the first day of the eleventh month. We have a fascinating historical reason for that. During the reign of the king of Ladakh, King Jamyang Namgyal (1595-1616 AD), the eighth King of Namgyal dynasty decided to invade Skardu-Baltistan. (It is a Shia Muslim majority region now in Pakistan-occupied Kashmir, northwest of Leh.) The best time to attack was two months before actual Losar due to the winter months, so he wanted his soldiers to celebrate before the war because they never knew what could happen. So that’s why Ladakhis celebrate earlier. 🌍Wishing You Most Wonderful Earth Day!🌍–One student wants to save this vanishing ghost. Did You Sponsor a Child at the end of 2018? On Your Mark . . . Get Set—GO! Wishing our school founder Khensur Rinpoche a very happy birthday!